When Steve Jobs recruited Microsoft to be the first third party applications software developer for the Macintosh, he was already concerned that they might try to copy our ideas into a PC-based user interface. As a condition of getting an early start at Macintosh development, Steve made Microsoft promise not to ship any software that used a mouse until at least one year after the first shipment of the Macintosh. Microsoft's main systems programmer assigned to the Mac project was Neil Konzen, a brilliant young Apple II hacker who grew up in their backyard in the suburbs of Seattle. Neil started working at Microsoft while he was still a high school student, and single-handedly implemented the system software for their hit Z80 card that allowed the Apple II to run CP/M software. Neil loved Apple, so it was natural for Microsoft to assign him to their new, top-secret Macintosh project. He was responsible for integrating Microsoft's byte-code based interpreted environment (which actually was a copy of a system used at Xerox that favored memory efficiency over execution speed, which was appropriate for the Mac's limited memory) with the rapidly evolving Macintosh OS, so he quickly became Microsoft's expert in the technical details of the Mac system. By the middle of 1983, Microsoft was far enough along to show us working prototypes of their spreadsheet and business graphics programs, Multiplan and Chart (they were also working on a word processor, but they neglected to mention that, since it would compete with MacWrite). I would usually talk with Neil on the phone a couple of times a week. He would sometimes request a feature that I would implement for him, or perhaps complain about the way something was done. But most of the time I would answer his various questions about the intricacies of the still evolving API. I gradually began to notice that Neil would often ask questions about implementation details that he didn't really need to know about. In particular, he was really curious about how regions were represented and implemented, and would often detail his theories about them to me, hoping for confirmation. Aside from intellectual curiosity, there was no reason to care about the system internals unless you were trying to implement your own version of it. I told Steve that I suspected that Microsoft was going to clone the Mac, but he wasn't that worried because he didn't think they were capable of doing a decent implementation, even with the Mac as an example. In November 1983, we heard that Microsoft made a surprising announcement at Comdex, the industry's premier trade show, held twice a year in Las Vegas. Microsoft announced a new, mouse-based system graphical user interface environment called Windows, competing directly with an earlier environment announced by Personal Software called "Vision". They also announced a mouse-based option for Microsoft Word. When Steve Jobs found out about Windows, he went ballistic. And, to my surprise, I was invited to a meeting in that conference room the next afternoon, where Bill Gates had somehow manifested, alone, surrounded by ten Apple employees. I think Steve wanted me there because I had evidence of Neil asking about the internals, but that never came up, so I was just a fascinated observer as Steve started yelling at Bill, asking him why he violated their agreement. Unfortunately, it turned out that while the agreement that Microsoft signed in 1981 stipulated that they not ship mouse-based software until a year after the Mac introduction, that ended up being defined in the contract as September 1983, since in late 1981 we thought that the Mac would ship in the fall of 1982, and we foolishly didn't let the ship date float in the contract. So Microsoft was within their rights to announce Windows when they did. Apple still needed Microsoft's apps for the Macintosh, so Steve really couldn't cut them off. Microsoft didn't manage to ship a version of Windows until almost two years later, releasing Windows 1.0 in the fall of 1985. It was pretty crude, just as Steve had predicted, with little of the Mac's thoughtful elegance. It didn't even have overlapping windows, preferring a simpler technique called "tiling". When its utter rejection became apparent a few months later, Bill Gates fired the implementation team and started a new version from scratch, led by none other than Neil Konzen. Neil's version of Windows, released a couple of years later, was good enough that Apple filed a monumental copyright lawsuit against Microsoft in 1988, but they eventually lost on a technicality (the judge ruled that Apple inadvertently gave Microsoft a perpetual license to the Mac user interface in November 1985). Mike Boich read my account and remembers things differently. I think I might have confused two different meetings, and the "Rich Neighbor" remark was made at a different time than when I describe. Hopefully, Mike will provide his version in a comment here soon. Many people compare Microsoft ripping off Apple to Apple ripping off Xerox. But there's one major difference. As you can see from looking at Bill's polaroids during Mac development, and some of the pictures of the Parc work, Mac made some huge forward strides. 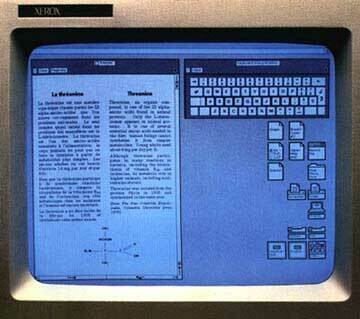 The Mac looked better and used vastly lower-cost hardware than Xerox. Windows 1.0 on the other hand was vastly inferior to either of them! didn't apple also give xerox pre-IPO stock? they paid for xerox's efforts, unlike His Royal Toadiness... but slowly his karma catches up with him. Just for kicks, I think some Apple employees should break into Bill Gate's house and steal his TV. Furthermore, Microsoft's early Mac software was compiled down to some weird byte-code representation which required an interpreter to run. While this was invisible to the user, the interpreter only supported 20 address bits, which meant that early versions of Word, Multiplan, and Excel had to run in the lowest 1 megabyte of memory. This was a problem since Mac applications normally loaded into the highest memory location available. Up through System 6, the Mac OS had to "special case" Microsoft software to try to load it in the lowest 1 megabyte of RAM. David's comment explains a phone call I got from Microsoft just after Excel shipped. This was before MacOS special cased MS apps, because Apple was only shipping 128K & 512K Macs. Beck-Tech had a Mac motherboard hacked with a prototype 2 MB memory expansion, and Neil wanted to know if Excel ran. It seems if Excel found memtop was over 1 MB, it loaded all the disk overlays into upper RAM, and ran the spreadsheet in the lower megabyte. Excel was enough of a memory hog that it normally couldn't fit all in RAM at one time. Here is Mike Boich's recollection of the 'Xerox' story, which goes a little differently, and is likely to be more faithful than mine: The meeting was one of the quarterly meetings, where Steve, Mike Murray, Belleville, you and I all got together with the Microsoft crew, which at was usually Bill, Jeff Harbers, Jon Shirley, and sometimes Neil and/or Charles Simonyi. I don't recall whether Windows had been announced, or we were just concerned about it, but Steve was trying to convince Bill that having a "Chinese wall between the Windows implementers and the Mac implementors wasn't sufficient for us to work well together. He was trying to get them to forget about the OS business, since the applications business would be much bigger total dollars. He said, "It's not that I don't trust you, but my team doesn't trust you. It's kind of like if your brother was beating up on my brother, people wouldn't say it was just your brother against my brother, they would say the Gates are fighting with the Jobs." Bill responded that "No Steve, I think it's more like we both had this rich neighbor named Xerox, and you went in to steal the TV, and found that somebody else had stolen it. So you say, "hey, that's not fair. I wanted to steal the TV". I don't think Windows 2.0 was done from scratch. I remember disassembling chunks of both and a lot of the code was the same. I remember reading something to that effect sometime ago. The story goes that Windows 1.0 or 2.0 has several APIs with exactly the same names as classic Macintosh API calls. Or maybe it was just 4 letter codes from the resource manager that were copied, I'm not sure. Could anyone with access to early versions of Windows and knowledge of the classic Mac confirm this? It could be a fun thing to expose to the public with concrete data. Remember how actual Quicktime code ended up in some early version of Windows Media Player? I think the weird byte-code thing reveals what was Bill's (Microsoft's) strategy at the time. By making the code somehow processor independent, they would build applications on the Mac, and in parallel try to build a virtual machine on x86 that replicated the behavior of the Mac APIs so they could hook their byte-code and run Excel, Word etc. on their platform and effectively cloning the Macintosh while doing it. A variation on the "black box" reverse-engineering scheme Compaq used to clone the IBM PC BIOS. An Apple person told me that the investment in Apple in 1997 was basically an out of court settlement over Microsoft's theft of QuickTime code. According to what he said, Apple found exact copies of QuickTime code in WiMP. Therefore, Apple _could_ win a lawsuit against M$, but as M$ had limitless time and money whereas Apple did not, M$ could drag the suit out forever. Jobs felt it was in best interests for both to go the route they did ($150m which was like pennies to Microsoft). I think it was done in that route as "vote of confidence in Apple." What I can't figure out is why people have put up with Wintel boxes for so long. I recently bought my first Mac, and to use a car metaphor, it's like going from a Yugo to a Toyota! If I did any job like M$ writes code, I wouldn't make it past my first week...maybe someone can explain the american publics fascination with bloated, buggy code? Geez Louise, what a cool story .... Is that in the movie? The day after this meeting, I received a phone call from Bill Gates. He was back in his office in Seattle (Redmond). He asked, "What are we (Microsoft) supposed to do? SHould we cancel our Mac development effort?" I responded, "Don't stop your Mac work. Keep going. We need your software. I'll try to manage Steve." We were highly dependent upon getting a critical mass of third party software into the market by the time of the lauch (Jan 24, 1984) and Microsoft's continued involvement was critical to this effort. Of course, in the end, the original Mac shipped in Jan 24, 1984, and Windows 1.0 was released in September 1985, more than one year after the Mac shipped, so MS did not violate it's agreement with Apple. Love the story, great to read about the origin of Windows, Apple & Microsoft. But: >>> [Apple] eventually lost on a technicality (the judge ruled that Apple inadvertently gave Microsoft a perpetual license ... <<< Seems quite disingenuous to refer to Apple's actions as being inadvertent when Apple tried limit Microsoft's license to Windows 1.0 but later agreed to the wording "derivative works." People still ideas all the time. Like the inventor of the fax machine. In fact, a fax machine is nothing but a waffle iron with a phone attached. And yes...I stole that quote. "Steve made Microsoft promise not to ship any software that used a mouse..." How does a large corporation make a promise? If this was a legal restriction, it would need a written and signed document. THAT is a proper promise. Even so, it appears Microsoft leaders did comply, since Windows was not released until more than one year after Macintosh. They should have waited longer, as the first two versions of Windows were very poorly cobbled together.